Renowned for their dependability and high residual values, the NT400 Dropside provides a cost-effective proposition in terms of initial outlay and fuel efficiency delivered by the Euro 6 engines. With a 'Business Ready' Dropside body, you'll be working with a payload up to 1480kg in the 3.5t version. Depending on the body length and cab configuration you choose, the NT400 Dropside has the capacity to carry between five and eight Euro pallets. The double-skinned aluminium bulkheads and side boards have outside hooks while safety hinges keep the detachable side boards in place when you're on the move. The NT400 Dropside features a 15mm plywood deck that is coated with non-slip resin to stop your loads from sliding around. There are up to 10 load-lashing hooks integrated into the bed that can restrain loads up to 400kg. THE NT400 DROPSIDE IS AVAILABLE FROM ONLY £328 PER MONTH. 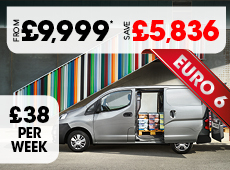 THAT IS JUST £75 PER WEEK!